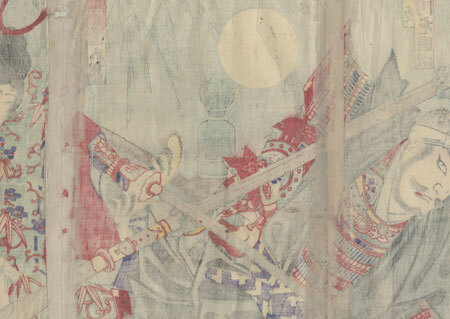 Comments - Terrific kabuki scene depicting the famous Battle of Gojo Bridge between the warrior monk, Benkei, and Ushiwakamaru (later known as Yoshitsune). 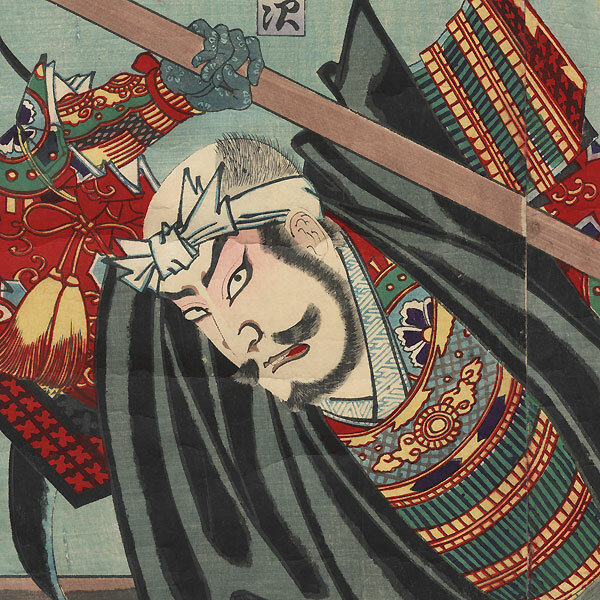 At right, the young samurai holds a folding fan in one hand as he deftly brings his blade down against a naginata wielded by Benkei. His opponent falls back with a grimace, surprised by the attack. He wears a black monk's robe over a suit of armor, with several other weapons visible above his back, including a large wooden mallet and a saw. A full moon glows above the bridge railing, with a willow tree framing the evening sky. 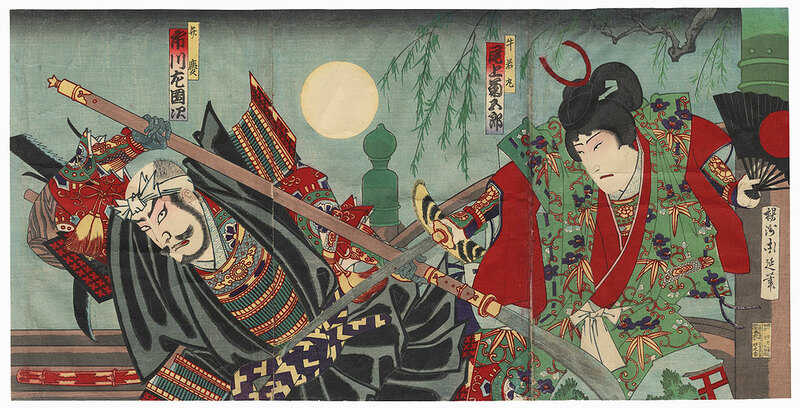 From left, the actors are Ichikawa Sadanji I as Benkei and Onoe Kikugoro V as Ushiwakamaru. A lively design with large colorful characters. Image Size - 14" x 27 3/4"
Condition - This print with excellent color and detail as shown. Three attached panels. Slight paper remnants on reverse at edges from previous mounting. Horizontal and vertical folds. Small loss at edge, a few small holes, repaired. Creasing and wrinkling, slight soiling. Please see photos for details.